It isn't often in advertising that we get a happy ending that isn't totally fictional and "brought to you by." But here one is, in all its furry glory! 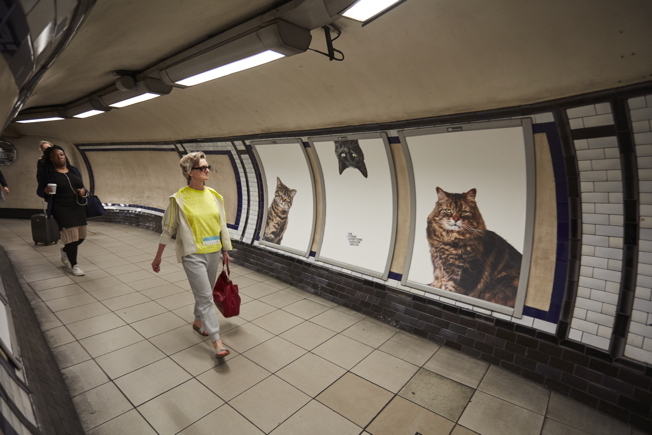 In early May, we wrote about Glimpse Collective's Kickstarter quest to replace all the ads in a London Underground station with images of cats. 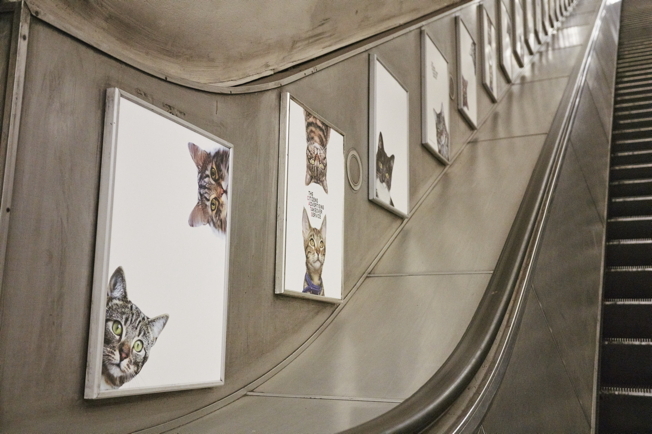 By the end of that month, U.K. animal rescue center Battersea joined forces with them, offering its cats up as models, in hopes that nice Londoners would experience love at first sight. Despite that endorsement, things weren't looking good. 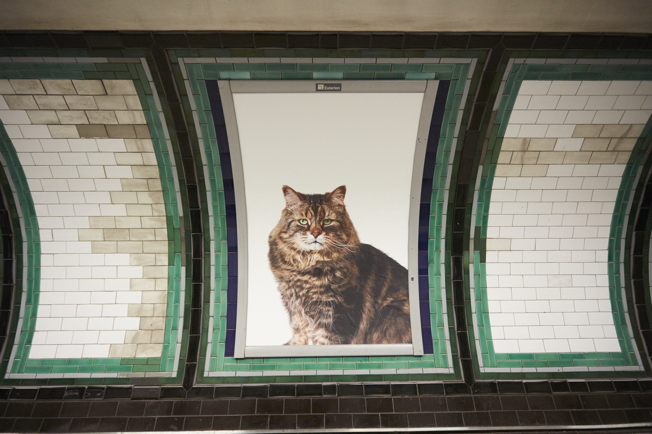 In the last few days of their campaign, Glimpse—which created the Citizens Advertising Takeover Service, or #CatsNotAds—had raised $17,487, just over half of its objective (£23,000, or nearly $30,500). The company appealed to agency heads to provide rescue funds, and we closed our minds and hearts, awaiting the inevitable snuffing-out of a beautiful dream. But this week we discovered God exists, and loves us. 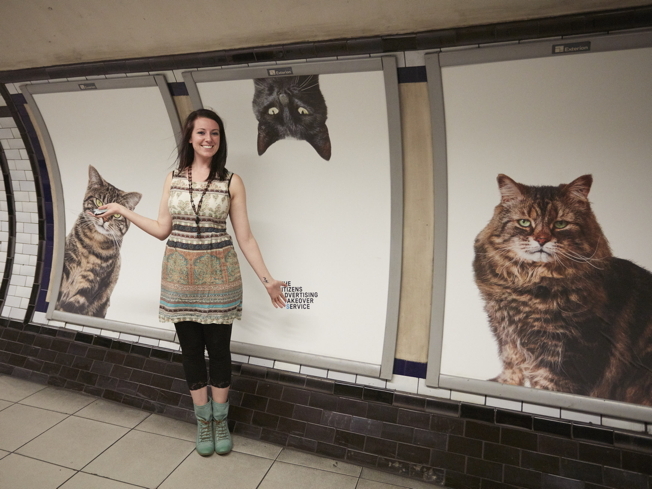 On Monday morning, commuters passing through London's Clapham Common Tube station were accosted by feline friends. 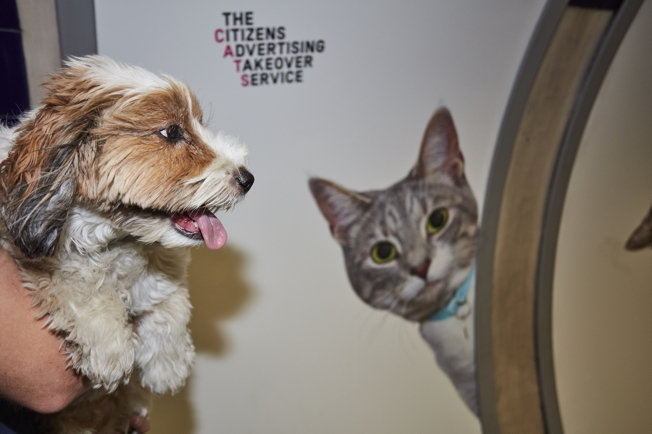 Cats from the Battersea Dogs & Cats Home, and Cats Protection, line the walls and follow you up and down the escalator. 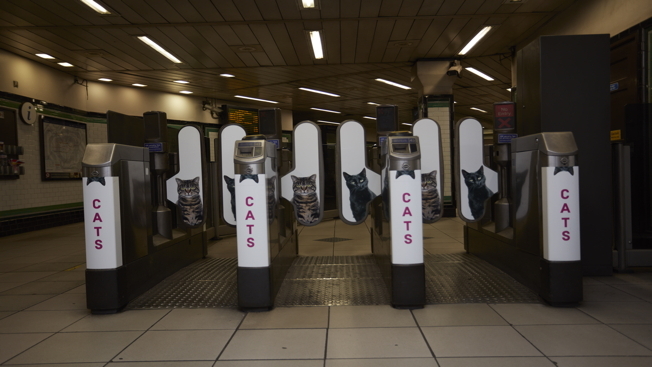 The result must have been baffling to commuters, judging by the looks on some of their faces. A total of 68 ads were replaced in all. "We tried to imagine a world where public spaces made you feel good. 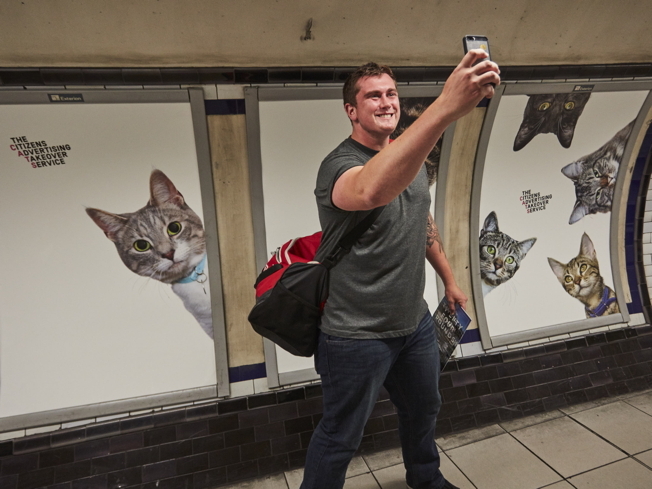 We hope people will enjoy being in the station and maybe think a bit differently about the world around them," says Glimpse founder and #CatsNotAds leader James Turner. "Instead of asking you to buy something, we're asking you to think about what's really valuable in your life. It might not be cats, but it's probably something you can't find in the shops." Asked how they were able to close the gap to their target fundraising amount, Turner tells AdFreak, "We raised the money through some great press attention, lots of hard work and hundreds of generous backers." In the end, "we didn't work with any agencies to reach it." 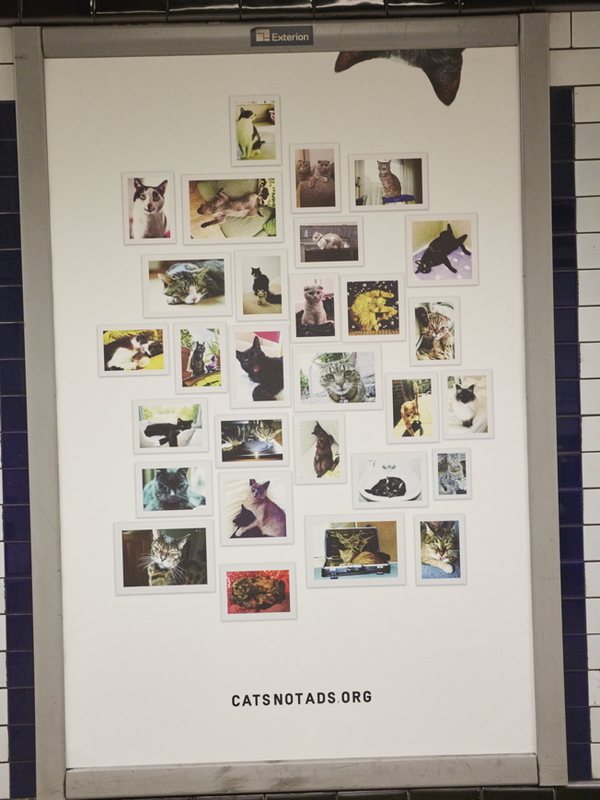 One poster features cats sent in by members of the public. Each person pledged £100 (about $132) to ensure immortality for their own moody domestic gods. One even flew in from Virginia to see the final result. 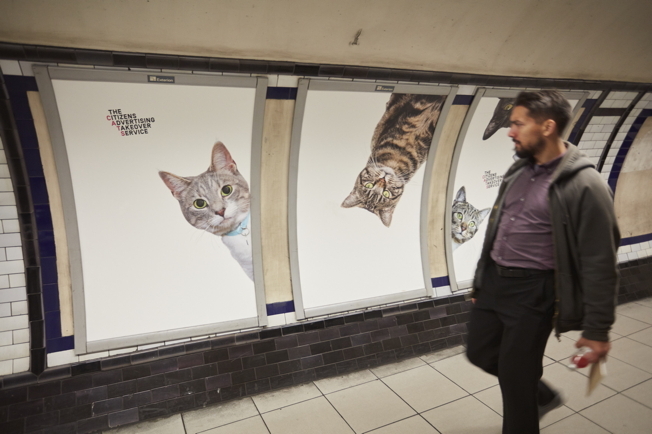 "We're thrilled that Battersea cats are among the stars of these posters," says Battersea's head of catteries, Lindsey Quinlan. 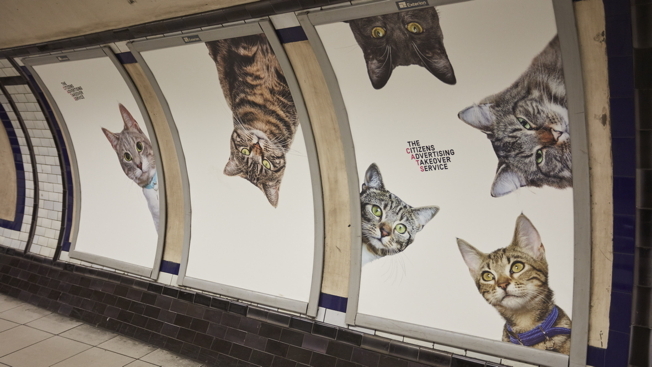 "We care for over 3,000 rescue cats a year, so hopefully this campaign will encourage lots more people to visit our centers and consider rehoming our fantastic felines." "Research shows cats are good for the health and happiness of people of all ages, whether it's providing fun, love or companionship," adds development manager Guy Chadwick of Cats Protection. 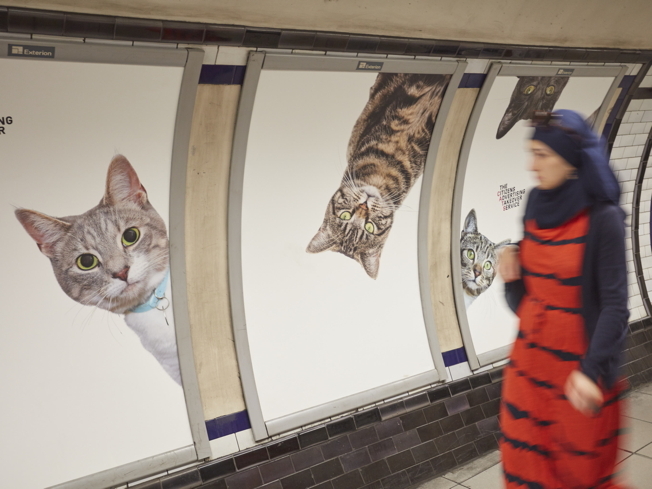 "Cats are also independent and can fit into a range of lifestyles, so we hope anyone who sees the posters will adopt one of our thousands of unwanted cats." The posters will be up for the next two weeks, with placement that includes ticket gateways, 54 escalator panels and 14 large posters that guide people to the main platform. Meanwhile, the #CatsNotAds team is already planning its next "takeover." Entries can be submitted at CatsNotAds.org. The current frontrunner? Dogs, naturally. But we'll be tossing our request into the ring, too: An unending deluge of Tiny Hamster.